Unique in the world, the Snow Hawk is made from the fusion of three powersports which include the motorcycle, watercraft, and snowmobile. 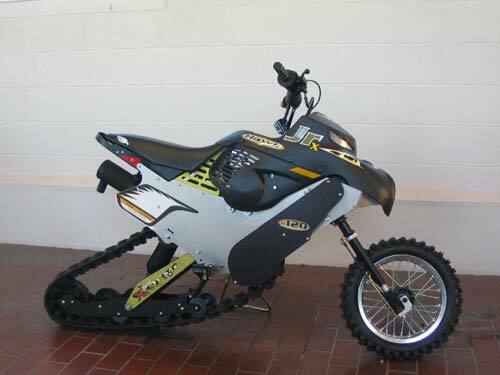 The Hawk Junior 120 is a small snow bike weighing barely 120 lbs., built for teens and adults under 160 lbs. The seat height is 31”. It is fitted with a tuned pipe, silencer, and diaphragm carburetor. Power is transferred through a unique centrifugal drive combined with a CVT drive clutch. The 90” track length is 6” wide with one-inch lugs. Stopping power is through a hydraulic disc brake system. Fuel capacity is about 1½ gallons. You can ride it year round, as it comes with a small wheel kit which replaces the ski and allowing one to ride in various terrains. Manufacturer: AD Boivin Design Inc.